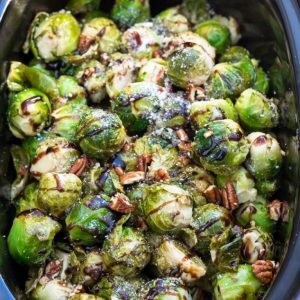 Slow Cooker Balsamic Brussels Sprouts: a perfect "set and forget" recipe that frees up your oven too! Add the Brussels sprouts to your slow cooker. Stir in the balsamic vinegar, maple syrup, olive oil, salt, and pepper. Cover with the lid and cook on HIGH for 1 – 1-1/2 hours or LOW for 2 – 2-1/2 hours, until the sprouts are tender, but still have a slight crunch. Stir in pecans, sprinkle with Parmesan cheese, and transfer to a serving platter. Serve warm and drizzle with additional balsamic glaze from slow cooker, if desired.